This soccer drill is a great shooting drill for teaching players how to shoot in traffic. 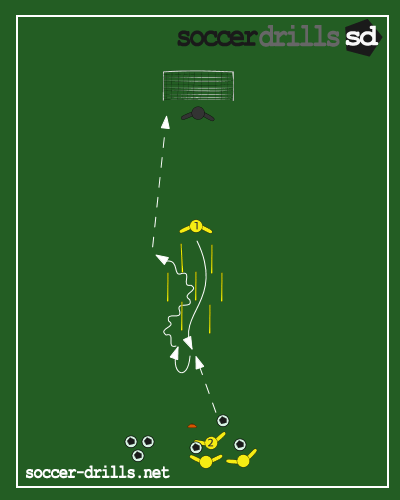 This shooting soccer incorporates agility, dribbling, and shooting all in one. Randomly place 6 to 8 training sticks about 22 yards from goal. Players should create a line about 10 yards from the last training stick with a large supply of balls. The first player from the line steps up between the last training stick and the goal about the top of the 18. This player will be the shooter. The shooter checks into the next player in line while weaving in and out of the training stick. As the shooter clears the last flag player 2 plays a ball into the feet of the checking shooter. As the shooter receives the ball he should turn quickly and dribble through the sticks. Once the shooter clears the last stick they should strike a shot on goal. The passer now becomes the shooter and moves into starting position. Focus on quick feet and agility while traveling through the training sticks. Receive the first touch closely and turn quickly. Dribble with speed through the training sticks but avoiding contact with the stick if possible. Shoot immediately after clearing the last training stick and focus on proper shooting techniques.